A United States Founding Father, William Few, Jr, was born on June 10, 1748. As an American Politician, Few was apparently born into a deprived yeoman farming family, but when Few grew up, he gained a successful career in politics and as a socialite. It appeared that Few had inherited his outstanding ability in both organization and leadership. Both of these were proven by his prominent involvement in the Revolutionary War. 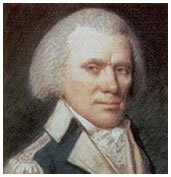 His ability in military operations, organization and leadership was applied in the battle against the British invaders. His expertise in military and devotion to the common good caught the attention of the Patriot cause leaders and allowed him access to vital political responsibilities. Few and his family earned a modest living by raising tobacco in the northern part of Maryland. However, the long droughts in the 1750s caused him to depart the region and try his hand on the Southern frontier. Few's family then took up residence alongside banks of Eno River, North Carolina. There they continued to hone and develop their farming skills. Few received an education and enjoyed reading, eventually going on to read law while continuing to farm. Few's family prospered and he moved on to become a political leader in rural Orange County. This family was involved with Regulators, a movement which developed due to the reaction upon economic and political restrictions. This movement was initiated by local lawyers and politicians. This protest grew up in confrontation by 1771, and then was called the Alamance battle. With glorious victory, the regulators demanded an economic relief and political representation immediately. One of the Few's brothers, James was put to death by hanging which caused the remaining family members to decide to move to Georgia, leaving Few behind to sell the properties and settle the family’s outstanding affairs. The opposition in North Carolina then attacked the Great Britain in 1770, instead. New taxes were applied and became the threat to unite all states. In gaining the liberties, Few joined in volunteer militia. Refusing to be a captain, Few then joined his family in Georgia. Once in Georgia, he opened a law office, and took part the Richmond County Regiment. Few’s regiment played an important role with respect to the latest Southern strategy. Following his success in politics, Few joined the House of Representative in the late 1770s. His political career rose when he was appointed as the representative of Georgia in Continental Congress in 1780 for six months. Few was sent home and assisted the reassembly of Georgia's dispersed government. Taken back to the parliament after this success, at the same time Few was asked to serve in Constitutional Convention in 1787 and in 1788 Few took part in the Georgia convention. Despite his plan to retire in 1793, Few instead was appointed as a circuit court judge in 1796. He became a reputable jurist and an important public education supporter. In 1785, he joined others in establishing the University of Georgia in Athens. Few’s wife wanted to leave the area and in 1799 Few finally left Georgia and moved to Manhattan with his wife. He made life through the infrequent practice of law and banking with a concurrent career in public service. After he became a federal commissioner of loans, Few finally returned to country home in New York. In the age of 80, he passed away, survived by his wife and his three daughters.